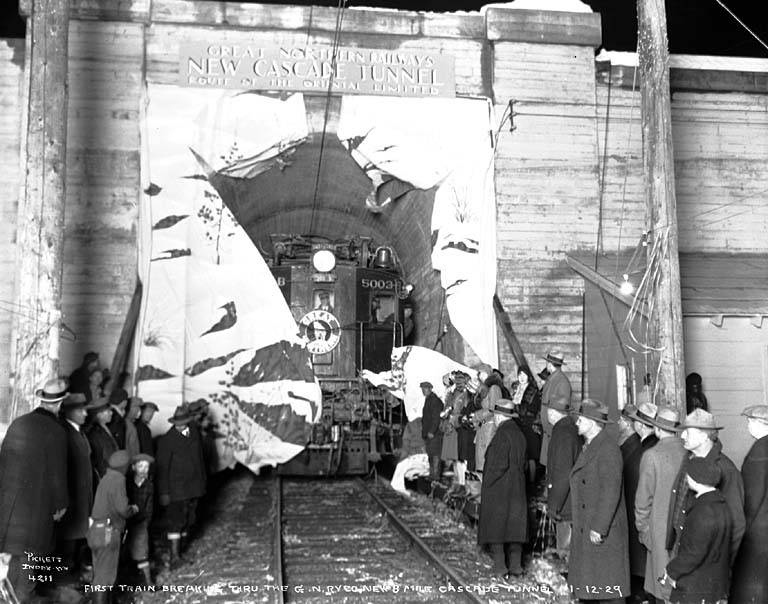 The Great Northern's Cascade Tunnel, also known as the Stevens Pass Tunnel, is actually the second structure to be built through the mountain, replacing the original in the late 1920s. At nearly eight miles in length it is one of the longest railroad tunnel ever built and remains in operation by successor BNSF Railway as part of its transcontinental main line connecting Seattle and Chicago. For roughly 25 years the tunnel was electrified by GN but this was discontinued in the mid-1950s when conventional diesels took over. Due to the tunnel's length it has a rather problematic handicap, even today, of requiring ventilation of the shaft for up to 45 minutes. As a result Cascade is somewhat of a bottleneck on the BNSF system. Of all the railroads James Hill either owned or controlled in some way, the Great Northern Railway is by far his greatest masterpiece earning him the legendary nickname, Empire Builder. Under his tenor the railroad would stretch from the Midwest to Pacific Coast and of all the Northwestern roads the GN was by far the strongest and most respected. Even after 30+ years of being gone the railroad still holds strong influences and memories from its Empire Builder passenger train and prominent dark green, orange, and yellow livery to its beloved mascot and emblem, Rocky the mountain goat (a common animal to the Rocky Mountains). Now that these railroads were all under one-control Hill quickly set about building to the Pacific Coast and Seattle which was accomplished just four years later in 1893. Throughout the rest of the early 20th century Hill worked to modernize his main line, especially through the Rockies by eliminating grades and curves. 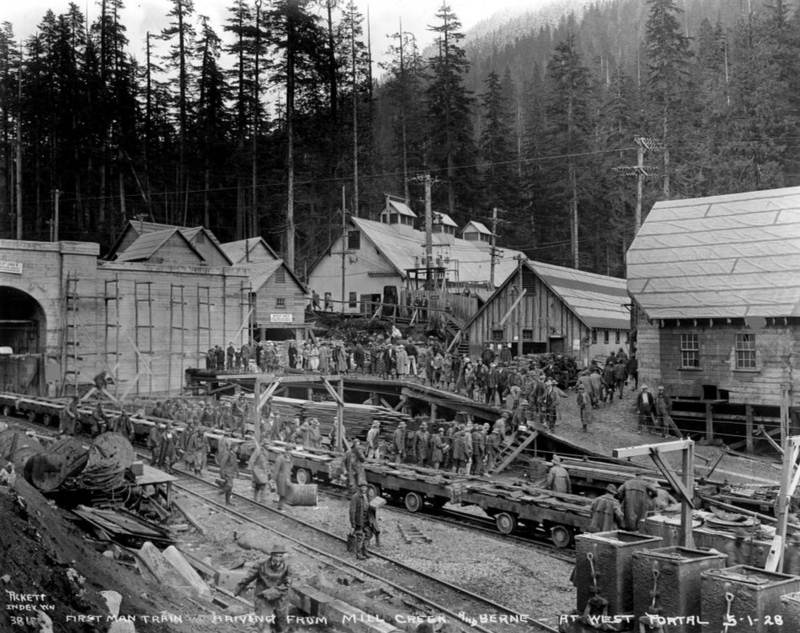 Before his death in 1916 he was able to achieve the most famous such project, the Cascade Tunnel located through Washington's rugged Cascade Range (a new tunnel was later bored and opened in the 1920s, which is still used today by the BNSF Railway). The western main line through the Cascade Mountains was also electrified for years (although it proved to be a troublesome and unreliable operation) until better ventilation and improved diesel locomotives allowed for its discontinuance in the late 1950s. James J. Hill, The "Empire Builder"
The original tunnel began construction in the late summer of 1897 and took more than three years to complete, opening just before Christmas of 1900. While it still sat at a very high elevation of nearly 3,400 feet it eliminated a hellish grouping of switchbacks required to scale Stevens Pass. This setup was not only a major issue due to the steep grades but also unrelenting snowfalls could bury trains for days. During one such incident in 1910 an avalanche toppled a passenger train waiting to be dug out, killing nearly 100 souls. The accident is chronicled in Martin Burwash's book Vis Major listed below. While the original 2.6-mile long tunnel improved railroad operations by reducing grades to between 1.7% and 2.2% it still sat high on the mountain, within range of punishing Cascade blizzards. With the avalanche disaster at Wellington, Washington the GN was forced to find a better route over the mountain. 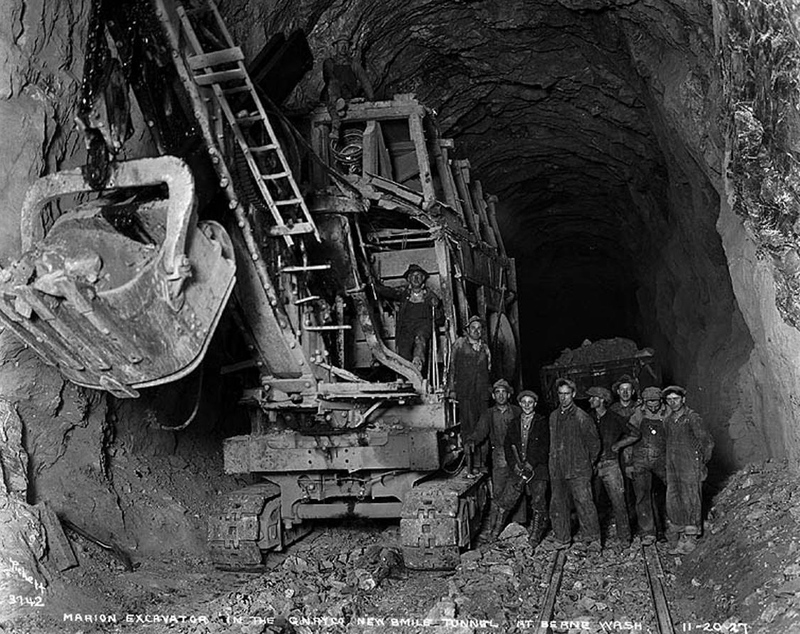 In 1925 the railroad began construction on a new Cascade Tunnel, located about 500 feet down the mountainside. For the most part this tunnel sat away from the worst of the mountain's winters being located below the highest elevations. Opened four years later in 1929 it was impressive in its length at 7.8 miles. However, while it avoided the worst of the winter weather, Cascade proved a headache to operate. 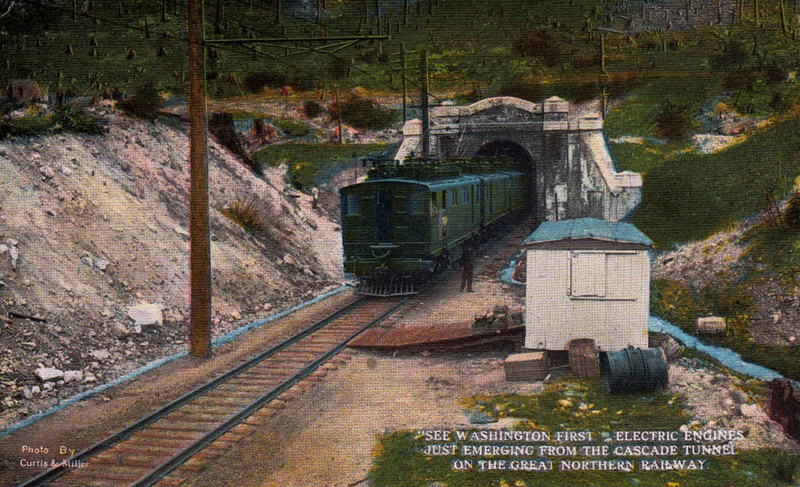 The extraordinary length forced the Great Northern to electrify the tunnel to avoid fumigation issues, caused by operating steam locomotives. However, as it turns out the railroad had constant trouble with its electrics, which always seemed to have issues obtaining the correct voltage needed to power trains over the summit and through the tunnel (it has been said that the GN's electrified operations were never engineered correctly). Finally, after World War II the railroad chose to abandon its electrics and switch to diesels in 1956. By doing so, the GN had to install an expensive ventilation system to keep the diesel exhaust well fumigated. This proved to be more difficult than originally expected; fumigation problems haunted the railroad and its successor, Burlington Northern, not only because of the tunnel's length but also due to the grade, about 1.7% from west to east. The first ventilation systems took up to, if not more than, an hour to clear the tunnel of fumes before another train was allowed to enter. Additionally, crews were required to wear, or at least have with them, respirators in the event of a ventilation failure as it usually took a train a full hour to scale the tunnel. Today, owner BNSF Railway has installed a ventilation system capable of removing exhaust within 20 minutes although crews are still required to have respirators with them at all times. For an idea of just how bad it could be for crewmen operating through tunnel please read this account by John Crosby who worked this segment of the line during the Burlington Northern era. Train speeds today for BNSF freights and Amtrak passenger trains are held to 25 mph. 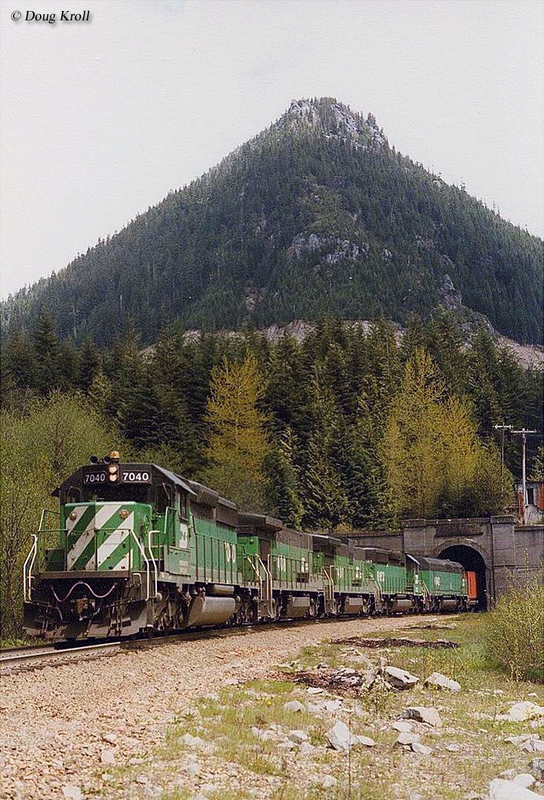 One still has to wonder, however, why Burlington Northern did not exercise its ownership of nearby Snoqualmie Tunnel after the Milwaukee Road abandoned its main line through this region in 1980. Using that bore, which was the best engineered tunnel across the Cascade range, would have saved BN and BNSF millions in maintenance costs and liability. For more reading about the history of Cascade please click here. For more reading about Snoqualmie Tunnel please click here.